Carati Jeweller is a respected Jewellery store in both Australia and New Zealand, offering customers individual jewellery along with some of the world’s finest brands such as Swarovski, Georgini, Pandora and Thomas Sabo. We also specialise in some of the finest diamonds that the industry has to offer. We have a variety of diamond and gold jewellery available in store. We also specialise in custom made diamond rings for engagements, weddings or as special gifts. We have a vast range of Infinity, Worth and Douglas and Dora wedding bands that we have custom made especially for our customers. At Carati, we aim to provide you with a vast array of fine jewellery along with some of the most familiar brands in the world. Carati jewellery stores will provide you with beautiful pieces for every occasion or milestone throughout life, or that little purchase to yourself! Owner and founder Joseph Howley believes that an individual purchase of jewellery should last forever. 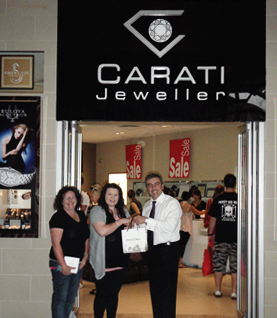 Carati Jeweller is also a member of Showcase Jewellers, a premier buying group with close to 250 stores. At Carati Jeweller we understand jewellery. Please call or email us if you have any enquiries.